While the Beanpot Tournament is laced with history, its 65th championship game concerns a bird of a different feather: Two elite teams. Just ask Jakob Forsbacka Karlsson, an assistant captain for the No. 3 Boston University men’s hockey team, about what it’ll be like to play against No. 4 Harvard University on Monday night at TD Garden. “These are the kinds of games you come to BU to play,” the Swedish center said. It’ll be head coach David Quinn’s Terriers (19-8-2, 11-4-2 Hockey East) taking on head coach Ted Donato’s Crimson (17-5-2), and they’re both likely to play for silverware come springtime. In the here and now, though, is where the young guns from Commonwealth Avenue and the old guard from Cambridge are thriving. For a full version of this story over on The Daily Free Press, click here. The Beanpot Tournament’s opening round is just four days away, but the No. 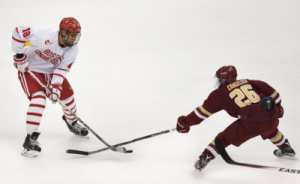 3 Boston University men’s hockey team has business to take care of first. On Friday night at Agganis Arena, the Terriers will play host to the University of Massachusetts Amherst. In many ways, the clash will mark the coming together of two sides heading in opposite directions. BU sits third in the PairWise Rankings, in second place in Hockey East and is 9-2 in its last 11 contests. UMass, meanwhile, is a lowly 56th in the PairWise Rankings, dead last in Hockey East and in the midst of an eight-game losing streak. “I’m hoping our guys don’t put any stock into any of that, because it means nothing [Friday] night,” said BU head coach David Quinn. This article appeared originally on The Daily Free Press. For the 271st and 272nd times, the No. 5 Boston University men’s hockey team and No. 8 Boston College will square off, this go around via a home-and-home series. The first tilt is set for Friday night at Agganis Arena, with the second unfolding Monday evening at Conte Forum. While the high-profile games are riddled with storylines, the Terriers (12-5-2, 5-2-2 Hockey East) carry extra motivation in knowing that the Eagles (14-7-2, 9-1-1 Hockey East) await. BU head coach David Quinn, who stressed his squad must first take care of business at home, spoke of the rivalry in a similar light. That healthy respect Quinn referenced is another theme that arose in and around Agganis this week. 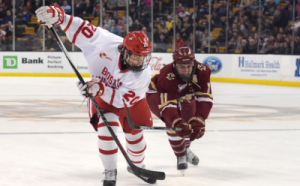 Doyle Somerby, BU’s captain and a senior defenseman, said he and several players have taken the short trip to Chestnut Hill to scout BC, particularly when now-No. 9 University of Minnesota visited on Nov. 27. On those occasions, Somerby said they got a glimpse into just how dangerous the Eagles can be. In net, head coach Jerry York’s team, which sits atop Hockey East, boasts Joseph Woll, the owner of a .920 save percentage and 2.43 goals against average. Building on out, the names to watch become even more dangerous. BC’s star defensemen are Casey Fitzgerald and Michael Kim, while the threats at winger and center come in droves thanks to Colin White, Austin Cangelosi, Christopher Brown, Ryan Fitzgerald and Matthew Gaudreau. Altogether, that group has banged home 44 goals and handed out 74 assists throughout the 2016-17 season. The Terriers feel well prepared to do just that, largely because this week at long last let them catch their breath. In fact, BU practiced with its full roster on Wednesday for the first time since Dec. 12, with seven of its players recently missing considerable time for the 2017 World Junior Championships. During that span, BU saw its American representatives – freshman forwards Clayton Keller, Patrick Harper and Bellows, freshman goaltender Jake Oettinger, sophomore defenseman Charlie McAvoy and sophomore forward Jordan Greenway – win gold alongside BC’s White, Woll and Casey Fitzgerald. Meanwhile, freshman defenseman Dante Fabbro won a silver medal with Team Canada. While BU’s focus in unwavering, it will be without two contributors. Sophomore defenseman Shane Switzer is still recovering from a concussion, while senior forward Tommy Kelley is suspended for the first game by Hockey East for a hit from behind last Sunday against the University of Massachusetts. Other than that, the Terriers are at full health and will be looking to build off a four-game winning streak. On the other hand, BC is 3-4-1 in its last eight games. Despite those trends and the magnitude of this conference set, Quinn said the task at hand remains the same. It seems like yesterday that the Boston University men’s hockey team’s 2016-17 season just got underway, but here we are. On Tuesday night, the sixth-ranked Terriers will host Yale University for a non-conference clash to close out 2016. Coach Quinn’s side will be slightly less than full strength, as senior forward Tommy Kelley is still out injured and junior defenseman John MacLeod is questionable. Meanwhile, freshman defenseman Dante Fabbro is off at Team Canada’s World Junior Championship preliminary camp. 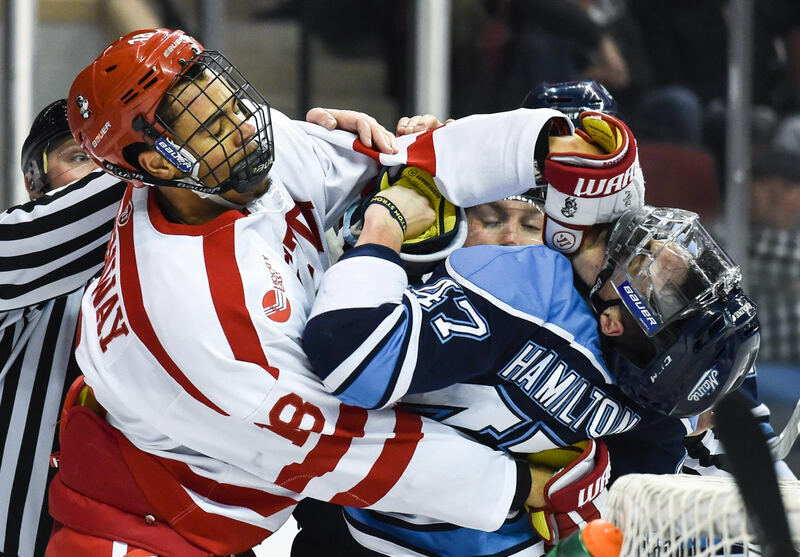 For a full write-up of what could unfold against the Bulldogs, BU’s fourth ECAC foe of the season, check out Nick’s story on The Daily Free Press. It’s also worth taking a gander at Coach Quinn’s recent comments on the struggles of freshman forward Kieffer Bellows.